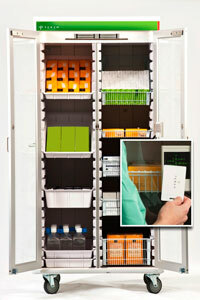 Terso Solutions Inc., a Wisconsin-based provider of inventory management solutions for health care and life science, announced that it has placed its 1,000th RFID storage device – a model TSO32 RFID-enabled cabinet – into production at a hospital in Santa Barbara, Calif. The TSO32 RFID-enabled cabinet offers 7.9 cubic feet of storage, flexible shelf configurations, and secure access for 24/7 automated inventory management. It is designed purposely for storing orthopedic supplies, cardiovascular products, pedigree bio-samples and reagents, among others. 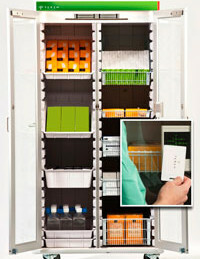 Terso’s RFID cabinets, refrigerators, and freezers allow customers to gain complete visibility to high value inventory. Additionally, the RFID-enabled cabinets allow users to monitor regulatory compliance, reduce shrinkage, and allow authorized users to access products anytime without manual sign-out. Terso Solutions also supports operations through their facility in Mannheim, Germany, and has implemented RFID storage solutions globally including deployments in Europe, Asia, South America, and Australia.